“Each one of us makes our own conscious decisions to create our own narratives, like a novel, and then it's up to others to interpret that narrative how they see fit and transfigure it with their own meaning,” Eaton explained in an email interview ahead of a reading he’ll give at Long Winter. It might seem like a noncommittal way to answer the question, but it actually says a lot about his personal story, as well as the story he’ll bring, tonight (Jan. 10), to The Great Hall. In his new book, Eaton plumbs the ontological situation of existing within a world where constructs are given tremendous significance. 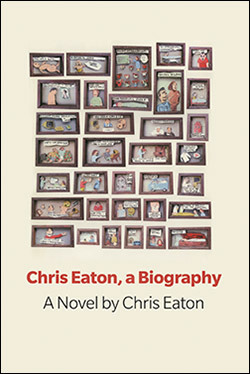 Chris Eaton, A Biography actually tells the story of dozens of people, all sharing the same first and last name. The author found these other Chris Eatons and their stories and wove them together into a grand “biography” he categorizes as a novel, thereby turning coincidences facilitated by constructs into a significantly larger construct (of significantly more substance). It’s garnered praise from The National Post, The Toronto Star, Maclean’s, LA Review of Books, and more. Below, Eaton speaks with us about his new novel and just what you can learn from Googling your own name. Well, that's a deep metaphysical question, isn't it? I suppose I'm whomever I want to be, the sum total of the stories I've collected and reshaped over the years. Each one of us makes our own conscious decisions to create our own narratives, like a novel, and then it's up to others to interpret that narrative how they see fit and transfigure it with their own meaning. At some basic level, however, I'm Chris Eaton the writer and musician and husband and dad (and son and brother and friend, etc.). Your new book is a result of some experimental self-Googling. Beyond the fact that the process has connected you with these other Chris Eatons that you now have to thank for, in what sense have these other people’s stories changed who you are? But the strangest thing about the project, the thing that made me start writing it, is all the things we have in common, all the coincidental dates and place names and likes and dislikes. I'm also worried that I'm starting to adopt some of their characteristics. For example, I've recently become interested in the work of Helen and Scott Nearing, and one of the Chris Eatons in the book was the custodian of the Nearing House in Maine for a while. I'm curious to contact him to talk about it now. Did the process ever get confusing? How did you navigate all of these different people that share the same name? Unbelievably so. First off, there were a lot of them. I forget the final count, but I'm going to say I found record of at least a few hundred separate entities. I read every single page on the Internet that had a variation of my name (this was all done before social media, thankfully, which would have made the research way more difficult and way more mundane), and I kept a lot of recipe cards with all the facts I had to include, and I was constantly re-ordering them so that they'd make more sense, and create a narrative, and maintain tension, which is important to me. I gradually culled that down to a few dozen that worked better together, that wouldn't be too repetitive while still overlapping. It was also written over 8 years, much of that spent on the road with Rock Plaza Central [Eaton’s band], and I had to keep all of these different stories straight in my head while I couldn't really work on them. A press release for Chris Eaton, A Biography states that through inputting our names in a search engine, “we realize that our own memories are no more valid in the construction of our identities than stories we've heard from others.” Can you unravel that a little bit? For me, the Googling-my-own-name conceit is a bit arbitrary. It's an easy thing to talk about with reference to the book, but it's far from the point. I really just wanted a lot of characters with the same name, built out of "real facts," so that I could piece them together in a way that would make them feel related. I guess there are two points. The first: our memories are notoriously unreliable. I have a hard time recalling, for example, whether things happened to me when I was younger or I saw them on TV shows. I also wrap my identity around things that happened before I could likely remember them myself, that I don't really recall the actual event so much as I recall people telling me that it happened. I'm fairly positive large parts of my identity (and I can't be the only one) never really happened, but regardless, those stories are who I am. And then there's this illusion of narrative, that we're dealt this random scattering of memories and forced to sort them. Because that's how we make sense of our own lives. That's how we don't go crazy because it presents the illusion of meaning, that the good or bad decisions we've made are the reason why our present is good or bad. It's probably why we typically craft our books and movies that way, with such linearity and redemption. As the hero of our own story, we need to have linear, forward movement. We can't just seem to be. We need to be headed somewhere, or have come from somewhere else. I suppose it's either the result of living in a capitalist society, where everything is about progress, or the reason why we live in capitalist society at all, because this linear progression is what makes us human in the first place. Did the process of putting together this book open you up to information about yourself that you weren’t aware of in the first place? I don't think I came across anything about me that I didn't know was out there already, if that's what you mean. But it did make me think more about this construction of personal narrative. Things certainly began to feel as though they could have happened to me. I was also surprised at how common the name was. Although there was one other unrelated Eaton family where I grew up (they had a daughter born the same day I was, and we were nearly switched at birth except for the fact that we had different body parts), I was the first Christopher in my family and the only one I had ever heard of. What is the strangest thing you have ever been made aware of as a result of Googling your own name? It's not really from Googling myself, but the first time I came across another Chris Eaton was the Christian rock singer, in the ’90s. I had just moved to Toronto and occasionally played coffee houses, when he rolled into town for a big outdoor concert at Nathan Philip Square. There were ads all over the place, and friends of mine who knew I had probably never played to more than ten people assumed it was me. This seemed the logical jump for them to make, instead of the more logical assumption that it was someone else, simply because I also had that name and played music. This was my first real experience with people not being able to get past a similarity in name. Because of him and a writer from Florida, Amazon still thinks if you like my novels you might also be interested in books on short-term missionary work.